CONGRATULATIONS to our FS@UTM Alumna Hafizah Noor Isa who made a significant national highlight for her involvement in a team of international researchers who made a historic discovery related to a direct detection of gravitational waves (GW) from the collision of two black holes. To reflect, Hafizah did her first degree in Physics from 2006 until 2009 in the Department of Physics, Faculty of Science, UTM. She furthered her Masters degrees in the same Department in Material Physics from 2009 – 2012 under the supervision of Prof. Dr. Md. Rahim bin Sahar. 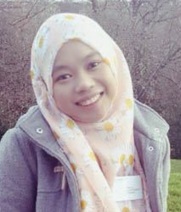 “Congratulations Faculty of Science, Universiti Teknologi Malaysia for producing a world class young scientist like Hafizah Noor who was involved in the worldwide network of gravitational wave detectors. Testimony of great learning, teaching and research in UTM’s ecosystem!” from UTM FB. Surely she will continue be a source of great inspiration to our current students in FS@UTM. Congratulations to Prof. Dr. Md. Rahim Sahar! Congratulations to Faculty of Science!